Hope you have been keeping up with my other social platform, because if you haven't then guys, you are not in-the-know of travels. I share them live on Snapchat and Instagram while the blog post only comes after a month or so. Getting back to today's post, I am kicking off Iceland Travel Series with packing. Below are the must have's in my opinion and experience. 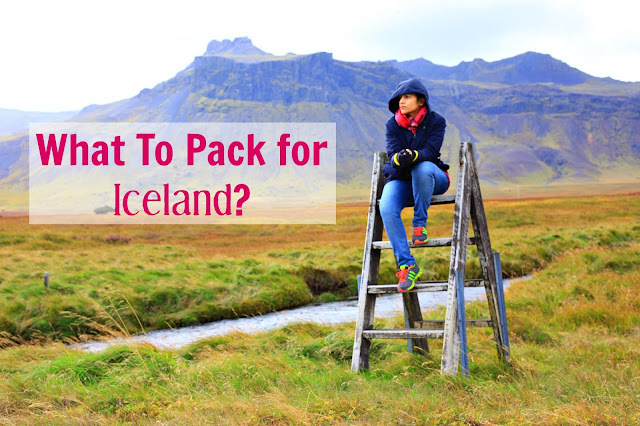 Hopefully you will find this list helpful, not only for Iceland, but for any destination which has extreme winters. 1. Gloves - Carry chunky, woolen, warm gloves (love these). Also, carry a pair of waterproof gloves. Trust me, it’s cold. If they have touchscreen pads (like this pair) it’s a huge bonus so you don’t need to take them off while using technology. 2. Scarves - I carried one for each day. Chances are you will be in your ONE heavy jacket on most days so the only way to tell one day apart from the other would be with scarves. Bring nice chunky warm ones because you are going to need them. 3. Beanies/Caps - You would wanna keep every part of your body covered. Carry a couple neutral ones (like this, this or this) so that you can wear them with everything. 4. Wool Socks - I was SO GLAD I carried a couple of wool socks. Your standard cotton ones are as good as not there. Trust me, my husband wore his cotton ones one day and he didn't survive past an hour before changing into woolen ones. 5. Thermals - Thermals are essential for a trip to Iceland. Get a super thin set (leggings/tee) that you can wear even under skinny jeans. They keep you much warmer than cotton and are super soft to the touch. 6. Long Sleeve Tee (s) - The key to staying warm in Iceland is layering. Bring some basic long sleeves to add or remove throughout the day and night. 7. Down Vest - I purchased one JUST for this trip (and now I can't believe I didn't own one up until now). I wore it almost almost every day. It was that ideal layering piece that you could put on and take off as the weather changed. 8. Down Jacket - Preferably foldable! The weather in Iceland changes every hour, hence you need jackets of various degrees. A foldable down jacket is perfect for this trip as it doesn't take up much space. 9. Sweaters - Another layer that you need between your t-shirt/top and the jacket. Carry REAL wool or cashmere ones because the synthetic ones don't stand a chance in Iceland. 10. Heavy Coat - This is a no brainer. You just gotta invest in one parka/winter coat. 11. Denims - I carried a couple in dark washes plus a black one. 13. Bathing Suit - I know what you are thinking - Bathing suit in Iceland? Yes! You must pack one. You’ll need it to take a dip in the geothermal pools. 14. Sneakers / Waterproof Boots - There will be rain, snow or winds and you will have to prepared for it all. You will also be hiking through mud and streams. You must bring a pair of boots which are waterproof and comfortable. Also, carry a pair of sneakers, for when you are in normal weather conditions. 15. Waterproof Backpack - I carried this one. I would suggest carrying one which can hold everything but is also comfortable because you would be hiking, climbing and jumping over glaciers. I am not kidding. These are my must-haves in terms of clothing. I did pack my own snacks as I do for all my trips. Stay tuned every Tuesday for more details on the Iceland trip. You're a master at packing Tanvi! Everything is so neat and organized! Love following along with your travel adventures! Definitely very helpful for packing for that kind of climate! Also Iceland is so beautiful and picturesque—I would love to go someday.